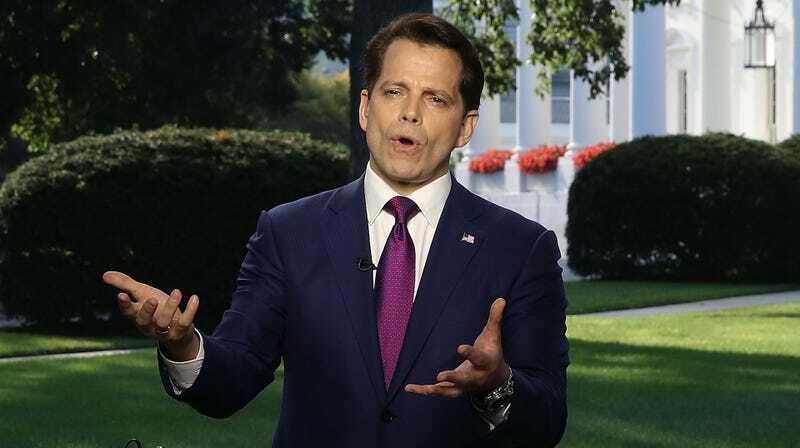 During new White House flack Anthony Scaramucci’s introductory press conference, he bragged that his famously exercise-averse and bulbous boss was in fact a sports genius, capable of throwing “a dead spiral through a tire,” “swishing foul shots” in a suit, and sinking, uh, three-foot putts. But here’s what I tell you about the President. He’s the most competitive person I’ve ever met. Okay, I’ve seen this guy throw a dead spiral through a tire. I’ve seen him at Madison Square Garden with a topcoat on. He’s standing in the key and he’s hitting foul shots and swishing them, okay? He sinks 30-foot putts. I don’t see this guy as a guy that’s ever under siege. This is a very, very competitive person. Runs in the family, I suppose.